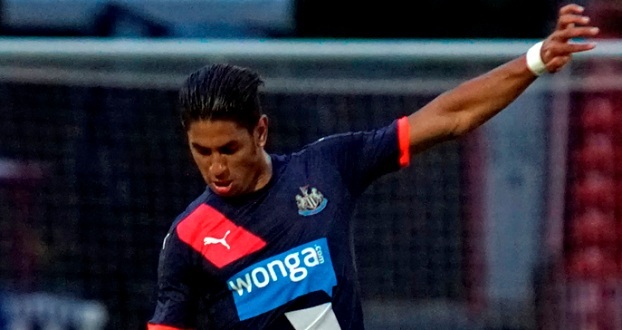 Newcastle United youngster Ayoze Perez has admitted that he is flattered at being linked with a move to Tottenham Hotspur. Perez joined Newcastle United from Tenerife for a meager £1.5million during the summer of 2014 and the striker was an unknown quantity to fans in England at the time. Fast forward 18 months though, Perez has gone on to be regarded as one of the finest young strikers around in Europe following a host of quality performances for Newcastle. With Perez performing brilliantly, it has been no surprise whatsoever to see the striker being courted by a host of top clubs and it was recently reported that duo Manchester United and Tottenham Hotspur were locked in a battle to win the services of the Spaniard for a fee of around £15million. Perez has now gone on to have his say regarding the rumors and has admitted that although he is happy at Newcastle, it is flattering for him to be linked to the likes of United and Tottenham. Speaking to IBTimes UK, Perez said, “I just know the same as you – what I hear, what I read. It is a great pleasure for me [to be linked with United and Spurs]. It is incredible, something very big and that’s because I’m doing well but I must go on. It’s my job.